The LLC has a SharePoint team-site (Yay! ). 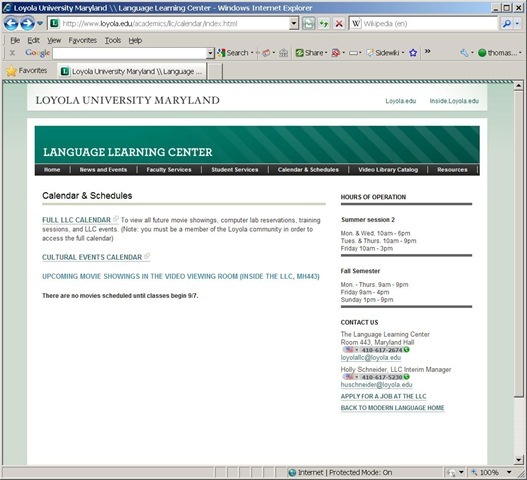 About the first thing asked for in September when I found out searching the company website that Inside Loyola – the locally branded version of DataTEL’s ActiveCampus – is built on MS-SharePoint. This means MS-SharePoint’s features are available to the LLC. This has benefits which come with groupware applications (aka “What’s Wrong with Email?”) that sit on top of an account management system likes AD. 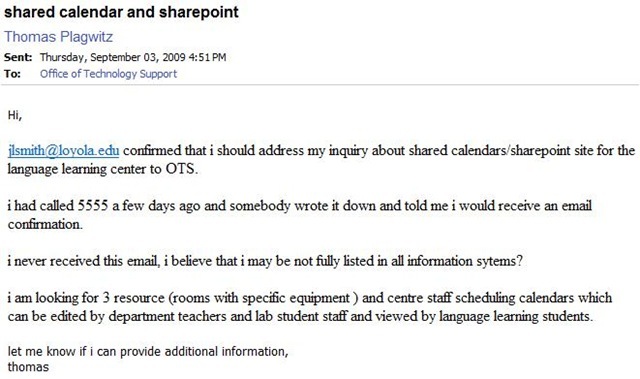 On the basis of the MS-SharePoint/MS-Exchange/MS-Active directory stack, you can build, with much less effort, a much better calendaring/scheduling solution than CGI’s from the 90s provide. Calendaring/Scheduling is a productivity task common to most businesses. Learning resource catalogues are much more vertical market specific. But if you cannot even manage the character input issues in foreign language video catalogue in your pre-.Net ASP solution, you might still find a generic solution based on SharePoint lists better. And once you outsourced common productivity software development to MS, you can get implementing e-learning beyond watching TV. MS-Excel: still the “Swiss army knife” of choice for the middle manager. Allows for: semi-automatic creation of reserve date sequences (insert series), given a start and end date; data validation during data entry, and, based on that, sorting and filtering and, based on that, finding. Blackboard Content management system (WebDAV) to manage reading and writing (editing) permissions. Staff can use MS-Excel to request videos – preferably at start of term – to be put on reserve within a start and end date, during which they will be periodically shown, by opening the spreadsheet from MS-Excel and filling in the green cells in the first empty row at the bottom. Lab Staff can use MS-Excel to periodically transfer video reserve requests into video showings. Lab Assistants can use MS-Excel to daily maintain video reserve desk and video showings. Students can use a web browser to preview video showing times during the remainder of the term. 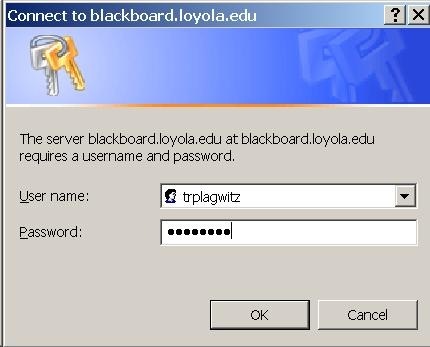 To open the video schedule for read-only, Loyola students and staff can simply click this link in their browser: https://blackboard.loyola.edu/bbcswebdav/users/trplagwitz/llc-pfiles/video/video-reserves.xslm. 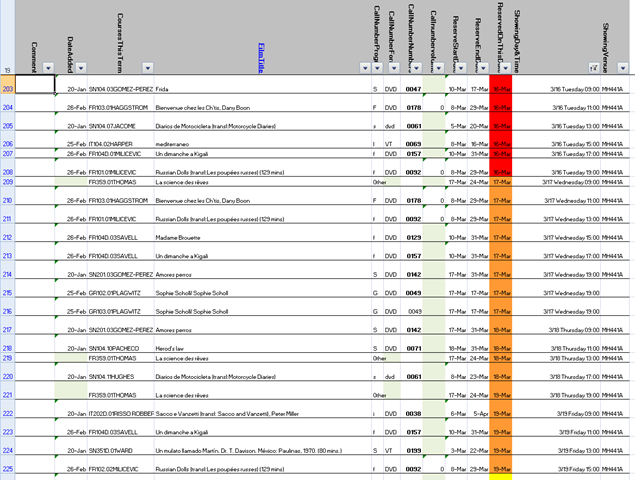 Even read-only access includes the capability to search, sort and filter the schedule data, but you cannot save back. To open the video schedule for editing, LLC and Modern Languages staff can start MS-Excel, click menu: File / Open, and copy/paste this link: https://blackboard.loyola.edu/bbcswebdav/users/trplagwitz/llc-pfiles/video/video-reserves.xslm, then click open. 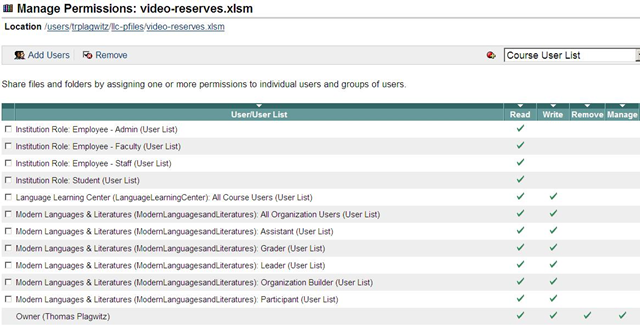 The “Course user list“ refers to courses. 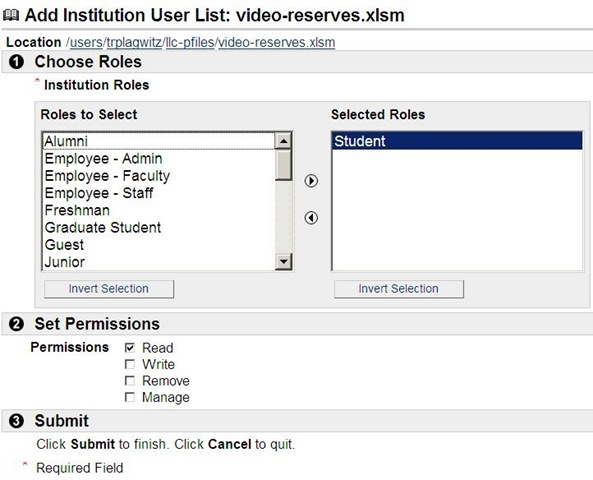 The “Organization user list” refers to departmental groups. The subdivision is meaning list for our department. The “Institution user list” adds the most global group level. Finally, you can make files available to the “Public”. Note, however, that this seems to effectively bypass the more fine-grained permission checks. E.G. if you give read access to the public, users who open your files will not receive an authentication challenge, so if you try to give some of the users write access to your files, that will not trickle through. Workaround: Do not use “public”. LLC Catalogue: This is not Google! I have been given access to the online catalogue program, learned that VS.net 2008 still supports classic ASP, and managed to make a couple of changes to the catalogue home and search result and pages which will hopefully make your learning material searches more successful. As explained earlier here, we have set up network shares for collaboration which you can access from your office computers. If you still have textbook media files in the LLC (talk to me on how to move them into the Blackboard content system and recycle them between terms by doing a course rollover in Blackboard ), access them on drive M: (for “media”). If you have students making audio recordings in the LLC, access them on drive S: (for “students”). A better way for doing recordings during self-access/homework is TBA. Some useful files for management are on drive H:, in the LLC folder. Some background info is here. H:\LLC\scheduling\channel55-presenter\channel55.ppt – the PowerPoint displayed on the Campus TV Network channel; for the LLC (TBA: as of March 2010, computer is being swapped out, and I have to migrate my application again – stay tuned). H:\LLC\scheduling\hallway-presenter\hallway.ppt – the PowerPoint displayed on the hallway screen outside of the LLC on MH, 4th floor. The PowerPoint files – one being displayed on the 4th floor hallway computer, the other on Channel 55 Campus TV – contain sections for announcements/advertisements which you may want to edit, update and/or add to. Open these files like files on your computer. 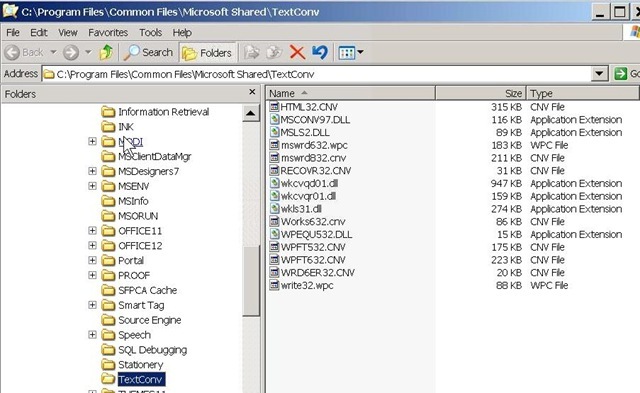 Overwrite the text in the files with current information. It is strongly recommended that you add slides by copy/pasting existing slides. If you need help with the PowerPoints, I trained and assessed the lab assistants through Language Learning Center Blackboard site. There should always be an assistant at the LLC desk that can help you with basic PowerPoint tasks. Your updates will not show instantaneously, but next day. I’ll check for changes in either PowerPoint file, backup the original and upload the new version over night to their respective computers. How to save MS-Word files in Wordperfect format. Teachers receive new computers with MS-Word 2007, but need to send files to publishers that accept only Wordperfect format. 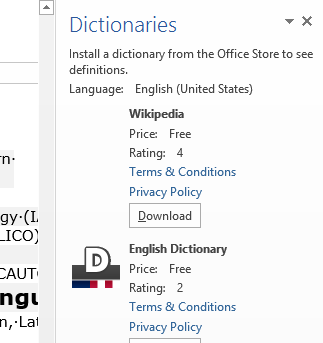 I located and installed an old (= not supported in MS-Office2007 anymore) WP-converter for Word 2003 which is the MS-word version we still have, side-by-side with MS-Word 2007, installed on the teacher computer in the Sanako LAB 300 (MH441). 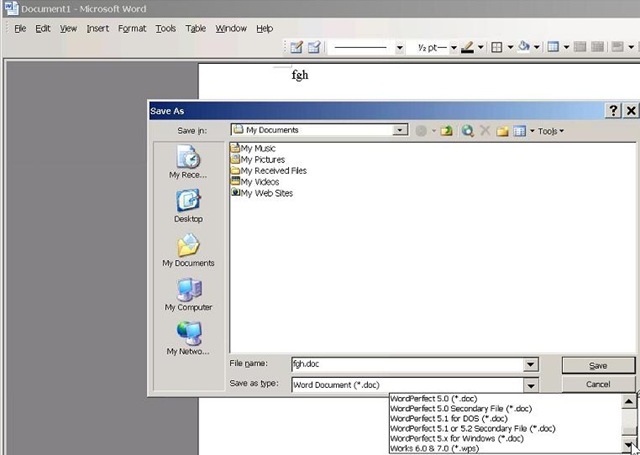 Browse to your document, drag it into the MS-Word 2003 window. Click Menu: “File”/ “Save As””. From the dropdown: “Save as type”, you can now choose one of the old Wordperfect format. Assuming you do not publish more than a handful of papers per year, this should keep you afloat until your publisher (I suggest sending them the URL of this webpage) accepts other file formats (RTF is a widely supported minimum standard, and MS-Word 2007 can save as RTF, Word Perfect can read it). More robust than the more common way using the default network shares of a Sanako Lab 300 – to my knowledge, up to this day Sanako Labs lack any integration with the LMS/VLE regarding the upload of student output – is using the assignment tool of the VLE which provides integration with the Student Information System and an entire infrastructure for assessment purposes (gradebook and beyond). 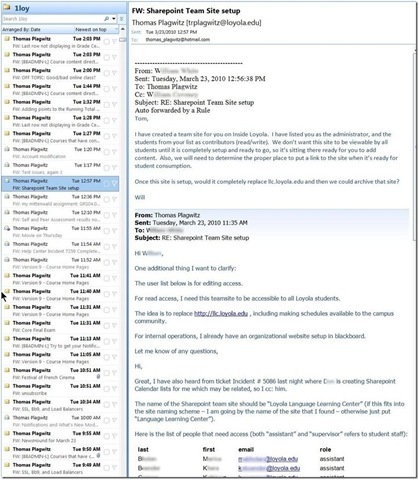 I know that some teachers use Blackboard email with attachments for assignments, others the blackboard drop-box. Some, including me, use the assignment tool which, since it appears to be far superior to the older tools, this post would like to advertise. The assignment tool automatically creates a grade center column. and you can upload a graded version to return assignments to the student and include comments. You can also create comments for the instructors only to view. Faculty can also use track changes and insert more fine-grained comments and corrections within MS-Word. How the student reviews a grade Blackboard audio recording assignments: TBA.